No pogi points for Looban, Gagalangin, San Andres Bukid, and Novaliches residents. No point for those with “baon” in disposable microwavable plastic containers. No point for local college org (that’s given)… if officer, add 5 pogi points. My score: secret (I found it silly, I modified this system!) Maybe I’m disqualified. What is the true taste of music? Delicious. This week, music has occupied my ears, and generally my emotions, as I have been exposed to three musical events: one in Malacanang Palace where I listened to the beautiful renditions of our college glee club, then in Blue Onion and Basement (Eastwood) where my eardrums almost popped out because of the loud music, and another one in the UST Singers “Classico” concert – all of these have exposed me to today’s culture. My first day of semester started not in school but in the President’s palace. I was assigned by our college journal to cover an event where our college glee club will sing local Filipino songs including the national anthem. With pride, I listened as their voices capture the real essence of what they are singing. 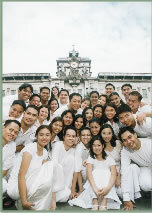 Truly, the UST College of Science Glee Club is worth the President’s call. Four days after, I met with my high school classmates and we had a night out at Eastwood City and danced ’til early morning. My ears became numb and I thought I’ll undergo an eardrum operation because of deafness – thanks to the loud R&B, dance and techno music in those smoky bars. When me and my pals came home, we all smelled like cigarette ashtrays. Eeeew! 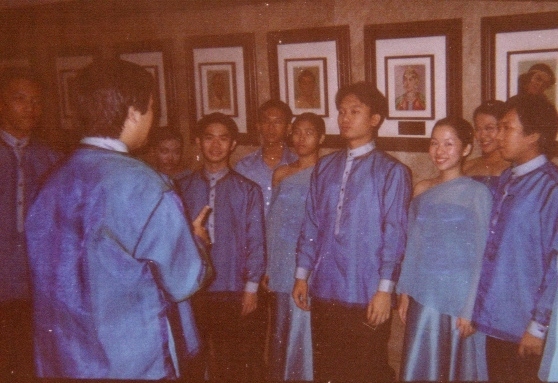 I attened a casual concert of the world-renowned UST Singers at the Museum of Arts and Sciences yesterday. It was inspiring. They sang classic songs from all over the world and even offered an encore of “Broadway” songs, all in a capella. Tickets to this concert were limited and guests were sophisticated (The way I see it). It was for people who appreciate the “Classic” and “classy” kind of music quite more melodic to the ears. Broadcaster Julie Yap-Daza was also there. Music always played a major role in our culture. Classical, acoustic, rock, pop, R&B, and other genres define your taste. As much as possible, we must accomodate all of these in order to become flexible and be able to relate with all classes of people.